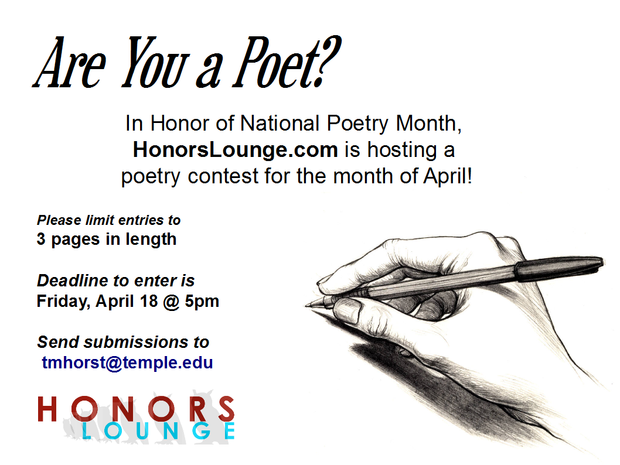 In honors of National Poetry Month, HonorsLounge.com is hosting its first annual poetry contest. Submissions should be no more than 3 pages in length, submitted to tmhorst@temple.edu by 5:00pm on April 18. Winning submissions will be published on the site the following week, and the first-place submission will also receive a book of published poetry from Honors professor Kevin Varrone! On Tuesday, April 15th, the sisters of Delta Kappa Delta Sorority, Inc. and the brothers of Delta Chi Psi Fraternity, Inc are having a can shake from 11-3 PM at Alumni Circle. All the proceeds will be donated to Northern Children’s Services, an organization that provides daycare services, adoption services, and residential services for children in need. On Thursday, April 17th, the sisters of Delta Kappa Delta Sorority, Inc. and the sisters of Delta Phi Omega, Inc. are having a workshop about the dangers of child abuse and prevention tactics at the SAC room 205 from 6-8 PM. On Tuesday, April 22nd, we are holding a bake sale in the SAC atrium from 11-3 PM. All proceeds are again being donated to Northern Children’s Services. If you have any questions, please contact Jooni, Vice President of Delta Kappa Delta Sorority, Incorporated at tue57143@temple.edu. Get hype, musical storytellers. Get real hype. HonorsLounge.com is hosting its first annual (possibly) Playlist Story Contest. The Playlist Story is just what it sounds like, combining music with narrative to create an interactive story. It's like creating a soundtrack for a short story, or creating a short story around your favorite songs. AB/BA is a student organization that explores the relationship between the fields of business and art in order for Temple students to gain knowledge about how these two worlds work together. 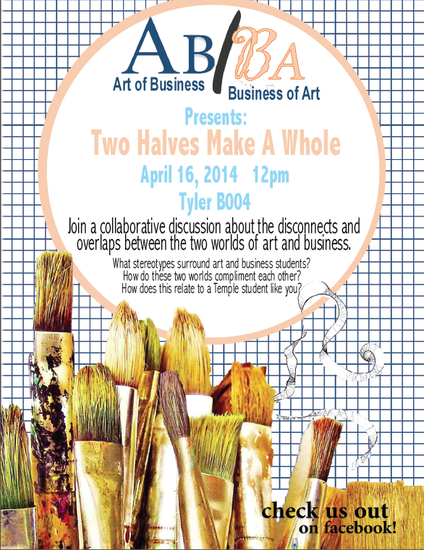 AB/BA is bridging the gap between Fox School of Business and Tyler School of Art and will be hosting an event, “Two Halves Make a Whole,” on Wednesday, April 16 in Tyler B004 at 12:00 to discuss similarities, differences and opportunities in collaborating between Tyler and Fox. Also, check out the Facebook group “Art of Business/Business of Art." In spirit of our upcoming Masquerade, HAB is holding a mask decorating party in the Honors Lounge on April 17th at 7:30. See you there! We are a new student organization called Kinetic Arts Initiative, and our objective is to bring kinetic art projects to life. Our first event, Kinetic War, is going to be a card game/rhythmic improv. It will be at 6:00 pm on April 16th in Founder's Garden. Hope to see you there! We are going to have The International Grand Ball II on April 25th starting at 7:00 pm. We are going to have a fashion show, dinner, and a lot of international dances from Temple University and Drexel. If you are interested, please contact Katerina Kazazi, Director of Communications for ISA, at tue69663@temple.edu. "Start. Stay. Grow." establishes and fosters direct relationships between students and the startup community in Philadelphia. Our monthly events allow students to interact with a curated group of entrepreneurs who are eager to answer questions, share advice and connect students to appropriate resources. Additionally, we are inviting students to "like" us on Facebook where we post job/internship opportunities, relevant news stories and events in the city. "Start. Stay. Grow." is a collaboration between Philly Startup Leaders, Technical.ly Philly & Nvigor. 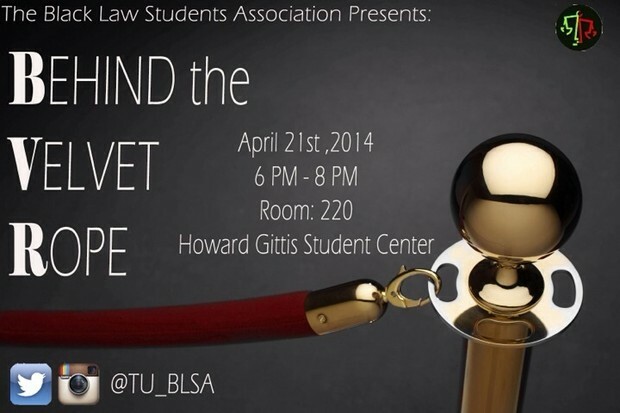 Tickets are free for students, and include a free dinner and an amazing networking opportunity. You don't want to miss it! 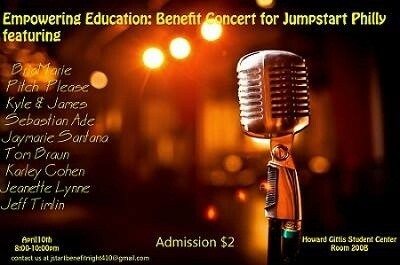 Empowering Education: Benefit Concert for Jumpstart! Join Grassroot Soccer at Temple University for an educational seminar on HIV/AIDS and Its impact on society. Dr. Scott Rutledge, Associate Professor and Assistant Chair of the Temple University School of Social Work, along with individuals with experience working with HIV/AIDS patients will also discuss AID stigma and health disparities. The event will be fun and informative on how to make a positive impact in your community! If you want your organization's event to appear on the next Shout-Out, just email honors@temple.edu by 5:00 every other Friday. The next Shout-Out will be sent out on Monday, April 28th. If you have any events you would like to advertise in the Shout-Out, please be sure that 1) they take place on or after April 28th, and 2) we are notified of them ahead of time.